For the past six years, I’ve had a swallows’ nest on my front porch. The porch is totally covered and enclosed on three sides, so it’s a perfect place for these little birds. I’m always delighted to see them return in the spring. In late April or early May, I see the parents sleeping on the high ledge under the porch roof and preparing the nest for eggs. When they start dive bombing me as I go out to the mailbox, I know they must finally have little ones. Soon I can see the babies’ downy heads popping up over the edge of the nest, beaks wide open, screeching to be fed. Not long after that, I see the little ones piled on top of each other, grown too big to comfortably fit in the nest anymore. Then I see them lined up on the ledge, maybe one or two of the less brave ones still in the nest, all ready to test their wings. And then, before I know it, the little ones are gone, and mommy and daddy are preparing for another brood. Usually they have four or five little ones in each batch, but this year the nest looked particularly full, so I got out my ladder and had a peep inside. I counted several times to make sure I wasn’t mistaken, but here are definitely seven baby swallows in this crop. They’re about ready to fledge, so it’s kind of funny to see all seven of them still trying to fit in their little nest, more piled on top of it and each other than actually inside. They’re testing their wings now, stretching and fluttering and making short test flights. I’ll be sad to see them go, but it’s always a delight to witness this miracle each spring. Are there any "new arrivals" in your life right now? DeAnna Julie Dodson has always been an avid reader and a lover of storytelling, whether on the page, the screen or the stage. This, along with her keen interest in history and her Christian faith, shows in her tales of love, forgiveness and triumph over adversity. She is the author of In Honor Bound, By Love Redeemed and To Grace Surrendered, a trilogy of medieval romances, as well as Letters in the Attic and The Key in the Attic, contemporary mysteries. A fifth-generation Texan, she makes her home north of Dallas with three spoiled cats. Last year a windstorm damaged my soffet area on the east side of the house. Up near the peak, (under the overhang) some of the soffet pieces came off and a few were just moved. I though it was rather sweet that a mother blackbird set up a nest in there. Loved hearing the babies calling for mom. the love affair is over. They have't moved out yet and of course, all the comings and goings mean bird doo doo right near my back door. Yes, i've been hit. I do hope the little darlings move out soon! But yes, I love watching baby birds and always have a sort of sympathy for mom (or mom and dad) when they approach and those insistent beaks open up and start demanding food! Unfortunately my new arrival this year was a yellowjacket the size of a small hummingbird--we caught in our house last night. They've nested in our walls before--reminded the professional exterminators of something from Amityville horror. Last time I was stung, I had a terrible reaction, so I'm looking to see where they're active and will likely have to call in the pros again. We had a Robin family set up housekeeping on our porch this year. Those babies are hideously ugly and yet cute at the same time. They won't be around long though. They're getting to big for the nest. Oh, Barb! I HATE flying insects. Especially stinging ones. Especially BIG stinging ones. You have my sympathy. Sweet post! We had a hummingbird nest last year--it was fabulous. The kids and I watched them learn to fly. What a joy that was. Oh, hummers are amazing. My sister and her husband set out feeders for them for a long time. They were always great to watch. And you could go out and sit on their porch and, if you were really, really still, the hummers would fly right up to you and inspect you. Poor doves. They're so sweet, but not very bright. We have two sets of doves. But what we're really enjoying this year is a set of cardinals right out the kitchen window. Dina, I've only seen two cardinals in my entire life, both in VA - one in Suffolk, and one in Williamsburg sitting on top of the church singing his sweet song. They are so beautiful and their song is precious. Yes, I'm a birdwatcher. DeAnna, your post is lovely - looks very similar to one I did on my blog last year so I better say that. Haha. 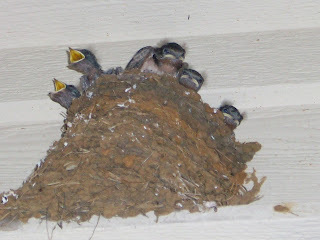 We only had 5 barn swallow babies last year though, and they nested in the peak of the garage near the door to my office. But not close enough poop on me. Well, actually we had another dozen or so nests around the farmyard, but this is the only one that I paid attention to. The year, the first barn swallows only arrived last week and so we have to be careful when we're out walking in the yard as they're flying about in groups of 2 or 3 and not looking where they're going. One thing on their mind, eh. I suppose they'll start nest building as soon as they choose their mates. They also court while sitting on the overhead wires and look adorable. Until today I've been setting up my camera on a tripod at the corner of the garage where our yard ends beneath the trees and the pasture starts. I film the ducks and other shorebirds in the flooded area several hundred feet away. Love seeing the ducks dip underwater with their tail feathers straight up and their orange legs treading water. :D My 700mm zoom does a good job - better now that I use a tripod. Oooh, Dina, I love cardinals, too. So very pretty and Christmassy! Oh, I need to go look at your birdie post, Anita. I'm sure it's great, and I'm sure your pics are better. I'm a terrible photographer! Here's the link to mine, but your photos are really good.